Tim Burton (Edward Scissorhands, Beetlejuice) attempts to work his gothic magic over one of the best loved stories of all time… Lewis Carroll’s ‘Alice In Wonderland’ and ‘Through the Looking Glass and What Alice Found There’, which first told the story of a young girl, who after following a rabbit down a hole, is transported to a strange world. Whilst the disney version of the tale relied on sweetness and light to delight the audience, Burton fans can be sure to look out for the same cartoon traits as earlier masterpiece ‘The Nightmare Before Christmas’. 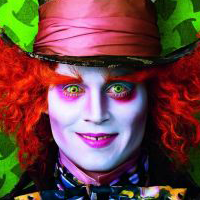 Among those who welcome her back is the Mad Hatter, a part tailor-made for Johnny Depp as he collaborates with Burton for the seventh time. “This character is off his rocker,” Zanuck says.